March 19, 2019, 1:05 PM · In an effort to promote the coverage of live violin performance, Violinist.com each week presents links to reviews of notable concerts and recitals around the world. Joshua Bell performed the Beethoven Violin Concerto with the Houston Symphony. Houston Chronicle: "...the Indiana native’s prowess on his 1713 Huberman Stradivarius lay as much in his close interpretation of Beethoven’s various moods as his technical mastery of the specific notes." Isabelle Faust performed Dvorák's Violin Concerto with the London Symphony Orchestra. theartsdesk.com: "She's the most engaging of players to watch, but that wouldn't be enough by itself if the intonation weren't perfect, the sound always clear, every phrase brought to life so that the to-ings and fro-ings of that Adagio actually made sense. And I've never heard the dance-finale turn more dangerous, a premonition of the wild wood nymphs' cavortings in Rusalka: a real work-out for both musicians and audience." Jennifer Startt, Jeanyi Kim, Timothy Klabunde, Ilana Setapen each performed one of Vivaldi's Four Seasons with the Milwaukee Symphony Orchestra. Journal Sentinel: "The evening opened with Startt’s sparkling, elegant take on Vivaldi's 'Spring' concerto...Kim brought technical precision, delicious contrasts, beautifully turned ornaments and expressive playing to the 'Summer' concerto...Klabunde opened 'Autumn' with a brisk vigor and snap...'Winter' was high musical drama in Setapen’s hands." Christian Tetzlaff performed Mozart’s Violin Concerto No. 3 in G with the San Francisco Symphony. San Francisco Chronicle Datebook: "Interestingly, it was Tetzlaff more than anyone who captured that quality of bottled lightning, in a performance that made up in freedom and grand unpredictability whatever it may have lacked in elegance. Every year, this fascinating virtuoso, who began his career as a brilliant but expressively constrained performer, plays like someone with increasingly fewer hoots to give." Anthony Marwood performed Beethoven’s Romance No. 2 and Violin Concerto with the St. Louis Symphony Orchestra. St. Louis Post-Dispatch: "Marwood’s conducting, from the front of the first violin section, was fairly minimalist: When not playing a solo passage, he waved his bow in the air to indicate the tempo. The Romance is a brief, lovely piece....It received a fine, focused performance from all, for a delightful opening to the concert." Ray Chen performed Prokofiev's Violin Concerto No. 2 with the Singapore Symphony Orchestra. The Straits Timtes: "...his playing was steady, precise and intense, combined with exquisite lyricism." Tafelmusik Baroque Orchestra performed 'Tales of Two Cities' at Disney Hall. Violinist.com: "Four Tafelmusik violinists created a gorgeous blending of sound during their performance of the Largo from Telemann's Concerto for Four Violins in G major." Jennifer Pike performed Mozart's 3rd Violin Concerto with the Royal Philharmonic Orchestra. Sheffield Telegraph: "Jennifer Pike was the soloist in Mozart's 3rd Violin Concerto, adding an exquisite delicacy to the composer's youthful exuberance, to the delight of a packed house. The same qualities were evident in Vaughan Williams The Lark Ascending as she sent the bird soaring noisily aloft, to almost disappear out of earshot." Lu Siqing performed the Bruch Violin Concerto with the Melbourne Symphony Orchestra. The Sydney Morning Herald: "Lu played with an intensely bright and biting tone that soared over the orchestral texture with impressive power. This worked to great effect in the most strident passages – particularly in the final movement – but there was a certain lack of tenderness and delicacy elsewhere that might have provided some useful contrast." The Pavel Haas Quartet performed in recital in Sarasota, Fl. Herald-Tribune: "Great string quartets require four performers with the technical skills to be soloists, who are willing to submit to the discipline of meshing their sounds in order to create something musically special. That was obvious here from almost the first notes." March 19, 2019 at 07:25 PM · Not really sure how to read that Tetzlaff review. March 20, 2019 at 12:27 AM · Don’t worry — the author didn’t know how to write it, either! March 20, 2019 at 11:54 AM · Tetzlaff review statement to ponder:" who began his career as a brilliant but expressively constrained performer, plays like someone with increasingly fewer hoots to give." Sincere question about this: was this the path of Ivry Gitlis or do I really not understand? March 20, 2019 at 04:10 PM · I think it's a positive thing - you do it your way, you don't give a hoot. Yes? 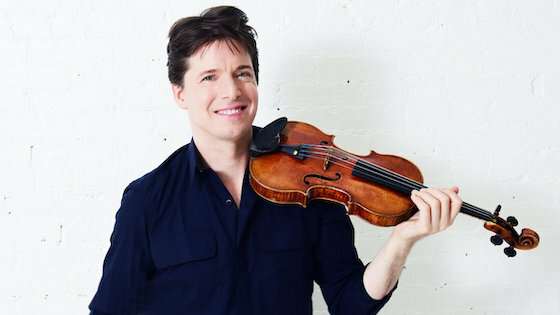 March 21, 2019 at 11:49 AM · Having lived in Indiana for almost as many years as Joshua Bell myself, I usually take at least a passing interest when I see a review of his performances. He has fabulous technique but can’t he play anything except the most popular concertos, short encore pieces, and The Meditation? This week I enjoyed a concert by the three medalists at last years International Violin Competion of Indianapolis. Naturally each of the three played challenging virtuoso pieces but overall it was a meaty concert with a minimum of fluff. It began with a 17 year old high school student from Tokyo playing the Bach d-minor Chaconne. I was especially glad to hear the Prokofiev second sonata on the program. I thought it unusual that there was no Paganini on a program of this sort but it turned out that there was an encore, a transcription of Paganini’s 24th caprice for three violins. March 21, 2019 at 04:39 PM · I don't give hoots. I give woots! (Which, I am told, are yeets these days). March 21, 2019 at 06:03 PM · Glenn, that sounds like a great concert! I have to come to Josh's defense, though, he plays all kinds of stuff! But probably a lot of reviews are for performances where he is playing the standards. He's still the guy that played for The Red Violin, etc.